During a six-week public engagement period in January and February, VTA hosted six community meetings, one virtual meeting and presented at 20 additional meetings hosted by city councils, community-based organizations, and neighborhood associations throughout Santa Clara County. The goal was to gain input and insight on the Draft 2019 New Transit Service Plan. This effort, supported by social media outreach, yielded close to 1,500 questions and comments during the public comment period which ended February 28. Through the month of March, VTA planners will be using the constructive feedback received from the public to help develop a final transit service plan which will be presented to VTA committees in April, and then to the VTA Board in May for their consideration. These meetings are open to the public. We encourage more engagement during these forums to share your thoughts on the final plan. 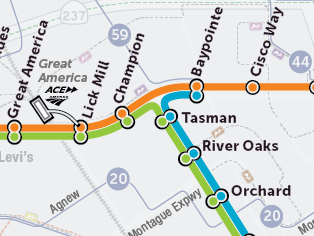 Any service changes approved by the Board would be implemented with the start of BART service to Santa Clara County, projected for late 2019. We thank the many creative and passionate community members who participated in this process to help shape a final product that will meet the service goals of the organization. A changing financial outlook has made it clear that the Next Network Plan that was planned to be implemented when BART service to Santa Clara County begins is not financially sustainable. VTA’s Board of Directors has asked staff to develop a new plan, which we are calling the 2019 New Transit Plan, that would cost about 4 percent less to operate than the Next Network Plan and would place a greater emphasis on increasing ridership. VTA staff have developed a draft of the 2019 New Transit Plan that builds on the thousands of points of input VTA received while developing the Next Network Plan. The Draft 2019 New Transit Plan proposes a number of changes while attempting to uphold Board direction and minimize impacts to current riders.